← Spring? Are You Suffering From Bear Confusion Syndrome? It has been 20 days since two murderers escaped from the correctional facility in Dannamora, New York. This has disrupted life in the North Country and affected many of us in the ‘neighborhood’ where the search has been happening; in and near the Adirondack Park. I live just a few miles south of where the search has been centered this week, in Franklin County, New York. What I have not seen written about is the psychological impact this is having for so many of us in the area near the epicenter of the search. The anxiety in the community is high and is taking more and more of a toll as the search drags on and the killers are still at large. The impact on people in the community is noticeable. That there may be killers in woods generates worry. Thoughts are all over the place in reaction to these unusual stressful circumstances. It is on our minds. In addition to the realistic disruptions, roadblocks, police presence, school closings, etc. there are a variety of psychological, cognitive and emotional, reactions happening for people. Some are obvious and to be expected. But some I have noticed in myself and others were more surprising. The fact that they are loose and could be nearby is part our daily consciousness right now. It is a distraction from the usual peace and calm. We are not used to being fearful. Our neighbors may have their quirks, but most are not scary. We are also not used to crime and concerns about dangerous men. Even locking our doors is not compulsory for most of us. For many of us in the Adirondacks the woods are like the cozy fort we made in the living room as a child, safe and comforting. But now we wonder who lurks in the woods. 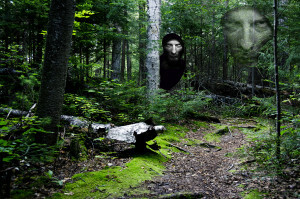 Now we realize that the woods may be providing a hiding place for two killers. A recent New York Times article discussed how easily they could hide and survive here. It is a disturbing fact that if they are here, as the police believe, they could be anywhere! On the path behind my house, in the shed down the street, or in the camp I visit on weekends. Driving around the area, with different eyes, I see all the houses, barns, and camps that could be places to hide. Most of these could be accessed, through the woods, and no one would see them. Many of us are scared and nervous. We are locking our doors. We are avoiding taking hikes or walking our dogs. We are keeping our kids inside. We are trying to figure out how comfort our children’s anxiety and confusion. For many of us our guns are closer to us. We are jumping at unexpected noises and wonder what the dog barking down the street knows that we do not. Are things really more dangerous right now that usual? Well yes they are. But it is also stands out in contrast to the sense of safety, illusionary or not, that we usually feel here. There is a clear and unequivocal identified threat; killers in the woods. Even as we go about our daily duties we are more on edge. The feelings are not typically debilitating, but the constant level of increased anxiety is taking its toll. We are on edge. We are tired. I have heard many people say how much they wish the killers were caught so they could relax, stop being fearful, worried, and letting the whole situation take up so much mental space. Anger at this going on and on is also increasing. It is not at anyone in particular but because of the frustration with the situation and the bombardment of uncomfortable thoughts and feelings going on. There is also a sense of helplessness. There is not much we can do except keep our eyes open in case we see something that might help them be caught. Being vigilant also takes energy. The combination of nervousness, fear, and vigilance also makes it more likely that the mind will play tricks. A deer in the distance darting across the road can look amazingly human for an instant. Out of the corner of my eye I have wondered if a shadow was someone peeking out the window of a vacant house. Since our usual “reality” has been shaken, our perceptions can be skewed too. Not surprisingly many of us are obsessed with the news reports on the progress of the hunt, local and national news reports, and wanting to know more about how they escaped and who they are. It is a progressing drama that many are intrigued by, but our fascination is more personal. We want information because it potentially relates to the safety of ourselves, our families, friends, and community. There is also something surreal about seeing our town, people we know, and places we know well on the national news –everyday. There is something surreal about the whole situation adding to the uneasy feelings. How much this is on our minds is reflected in what we are talking about with people we know, on Facebook, at work, in restaurants, at school, and in the bars. Speculation is rampant about where they might be, what they will do or have done, details the news had wrong, and what should be the next step. We are sharing our frustrations and stories about how this is impacting us. Humor is sometimes a bit twisted, “Been harboring any fugitives lately?” But this is a needed release of tension. On the positive side there is a sense of community, like the camaraderie when people pull together after a devastating storm. In some ways it is good that they are such bad guys, murderers, so clearly dangerous, so clearly the enemy. Our attitudes are united, fear and concern are bipartisan. That unites us as a community. It is unlikely they will be folk heroes for what they have done. Only the sociopathic lunatic fringe is likely to want to help them. Also present is lots of “what if” thinking. Imagination meets anticipation, fear, and wanting to be prepared for anything. “What if I see them in my back yard?” “What if they are in the garage when I come home?” “What if they capture my dog and demand a ride or provisions for her life?” On the Sunday after the escape I was driving through dense woods in the area of the first search grid. I became anxious and preoccupied with thinking about what I would do if they jumped out of the woods with guns and tried to get me to stop. I was relieved to get home that night! For many there is not even relief when we sleep. All the fears, speculation, what ifs, imagination, and far-fetched possibilities coalesce unconsciously and manifest in dreams and nightmares. This is even worse for people already struggling with fear and trauma issues. A common theme is that the escapees are suddenly present in our home, car, or camp. In the dreams they appear without warning as menacing and violent killers willing to make true our worse fears. Personifications of the boogie men we feared as children, but we can see their faces and we know their names. There are many psychological, cognitive and emotional, reactions happening for people right now. The killers are in our woods and we are at least a little traumatized. None of the responses or reactions discussed above is unusual under the circumstances. The stress is temporary and things will return to normal. Eventually there will be a resolution. Perhaps we will have more empathy for all the people in the world who live in constant fear for their safety. 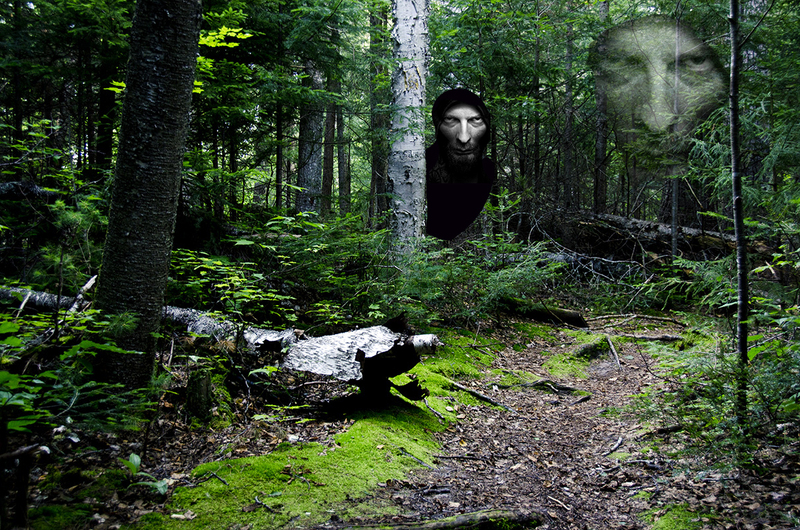 Years from now we will still be talking about the summer there were killers in our woods, it will become local lore. For now I hope they catch these killers so we can all relax again. Please feel free to comment below, I would like to hear some of your experiences. This entry was posted in Community, Local-interest, News. Bookmark the permalink. I have given thought to the psychological impact of this incident. I now live 1,000 miles south of the area affected and though I am not in any danger here, l have experienced mild anxiety since the escape. I, too, have followed news reports closely, hoping and praying for peaceful and swift end to this nightmare. I have also felt deeper sadness over the depravity of those involved who assisted the convicts. How tragic. I do know that North Country folk are survivors and life will return to normal. I pray the experience will continue to invigorate the sense of community and support for our weary law enforcement long after this summer of terror. You hit the nail on the head. Well said!